The 5+ Best Hunting Fanny Packs for 2019 – Reviewed & Compared: When you plan to go out on a hunting adventure, it is obvious that you will have to carry a lot of hunting equipment and gears along with you. This is the reason why you need a good fanny pack so that you can keep your hands free of all the baggage. Fanny packs are any day better than hunting bag packs. That’s because fanny packs are smaller in size and also comfortable to carry. To put it in other, a quality fanny pack can be your best companion out in the wilderness when you go out for hunting. With fanny packs, you don’t have to bother carrying your hunting equipment in hands or deal with the heavy canvas of the hunting bag pack. The fact that fanny packs are compact doesn’t mean that they will not be able to provide you with enough storage space for your hunting tools and gears. But you need to make sure that you get the best fanny pack for yourself. The best quality fanny packs are made waterproof and are made of quality material. 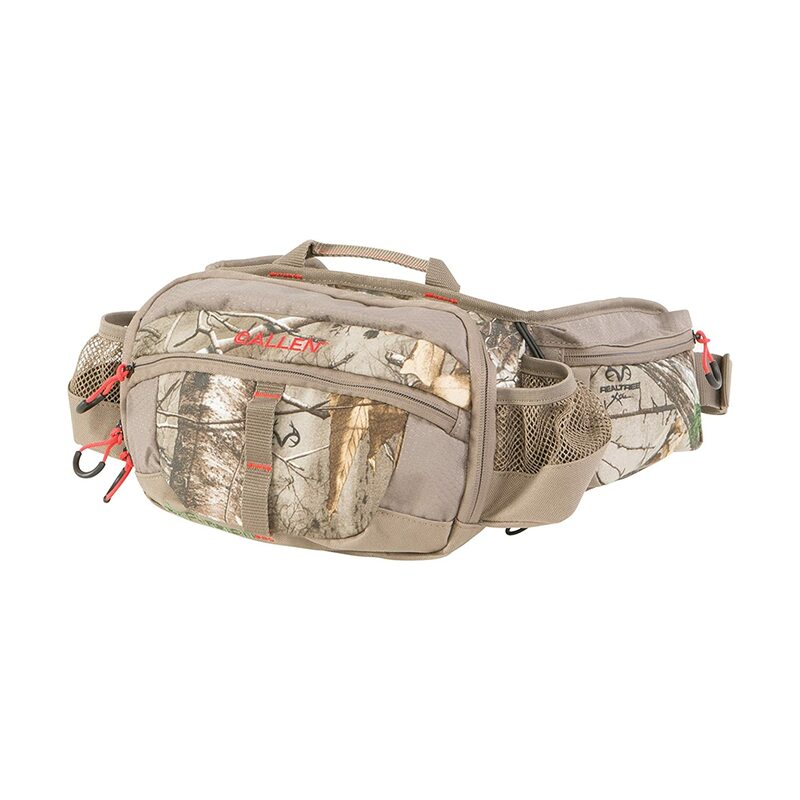 They have easily accessible pockets to store your hunting tools and other stuff such as water bottles, baits, etc. These fanny packs are made of heavy-duty materials that can withstand any weather conditions and sudden pulls, yanks, and snags. If you are looking for the best quality fanny packs then, we have the right options lined up for you. Have a look through our handpicked products. The products listed below are all top quality fanny packs that are equipped to face the wilderness without an issue. With these fanny bags, you can channel your focus only on hunting instead of worrying about your stuff. All these products are handpicked and have some special features because of which they are on the list. Let’s check out the details of these products. If you are looking for a high-end product then, look no further because this is your option. This 2-pound bag has all the necessary features that you may be looking for in your fanny bag. This is an ideal bag for people who are tired of carrying the load of a heavy hunting bag. The bag is designed in a way that prevents it from getting saggy. Also, the bag is made completely waterproof so, that no harm comes to your precious hunting tools. The bag comes with a lot of spacious pockets for you to store your stuff. Thus, one thing is clear that you can always keep your hands free with the Badlands’ Monster Fanny pack. To ensure the quality of the product, the bag has been made with only the finest quality material that is not only strong but durable as well. If you are still unsure of the product then, you should know that Badlands provide you with a lifetime warranty on their products. And the best thing about this bag is that no matter how much load you carry, you won’t feel the weight because of its waist support band along with the shoulder straps. Apart from this the bag also has a lot of other features that are listed below. The bag comes with three removable or adjustable shoulder straps along with six spacious pockets to store in all your essentials. The bag is also equipped with 1 liter of hydration. The bag is made with Delron flex-frame and ergonomic molded foam which prevents the bag from sagging. The bag is equipped to carry heavy weight. The bag is also made completely waterproof. For better support, it has shoulder straps combined with waist support bands. In short if, you are looking for a fanny pack with all the qualities in one then, this is the option for you. Invest one time to get the best product in the market. If you are on a fixed budget and yet want the best quality fanny pack then, this is the bag you need. This bag is probably the best bag you will get within a fixed budget frame. Designed to withstand even the roughest and the toughest of the conditions you can never go wrong with this bag out in the wilderness. To put it in other words, this bag is designed to be your most trusted companion out there. Also, to make it more comfortable the bag comes with adjustable waist strap and snap buckle that is designed to work flawlessly. And the amazing camouflage color of the bag will keep you perfectly hidden from your prey. In short, this is an ideal bag for going on a longer period of hiking. This product is not only strong but also very durable. The bag comes with a sufficient number of pockets along with water bottle holder for you to carry your stuff with ease. The material used to make the bag is completely waterproof. The product comes with adjustable waist strap and padded hip belts for better comfort. To conclude this is a bag of great value and is just perfect to take it on long hunting trips. Within a fixed budget, this is the best bag that you can get. This is one of the best fanny packs out that you can get in the market. There is not a single fanny pack feature that you will find missing in this product. The bag not only looks stylish but is also made strong and durable for withstanding rough conditions. 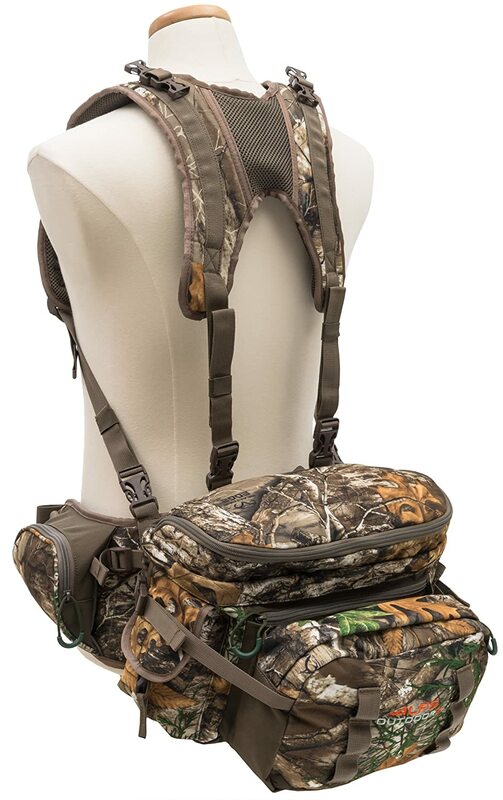 Carry all of your hunting tools with great ease and comfort with this product. Once you take it out on a hunting ride, you will know how good the product is. Now, let’s have a look through its features. The bag is equipped to carry heavy loads without a problem. The versatile design of the bag can store any type o hunting tool without any issue. The bag comes with plenty of room and pockets along with sturdy zippers for you to store your stuff. The bag is made waterproof so, that your stuff can remain safe. The bag also comes with an expandable portion for you to store more items. In short, it can be said that no other bag can beat the quality of this one. This bag is just ideal for the wilderness. Buy it, and you are all sorted to go out for hunting. 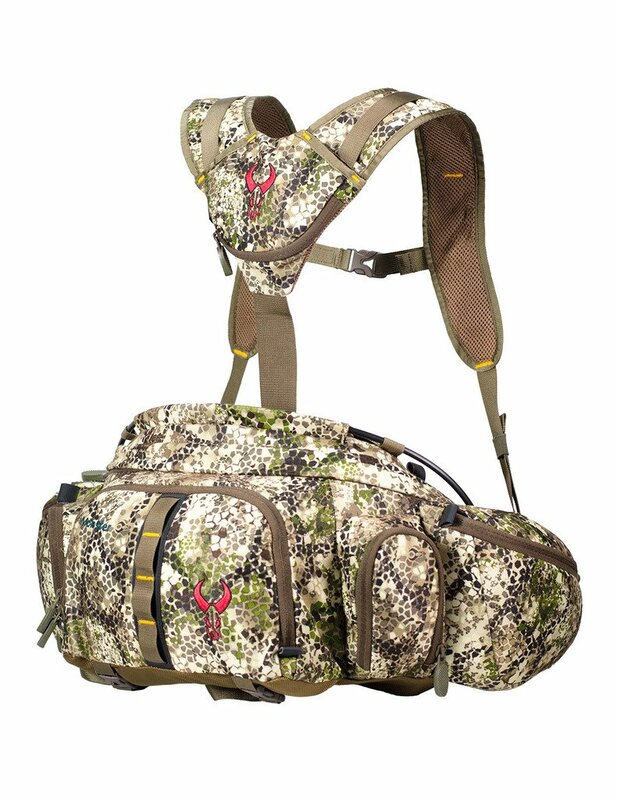 With this bag, you can carry all your hunting stuff with great comfort and security. The bag has a versatile design which enables it to carry any hunting tool starting from bow to a rifle with great ease. If you are looking for a comfortable fanny pack then, this is the option for you. The bag also comes with a lot of other features. The products from ALPS are usually of great quality. No wonder we have two Fanny packs from ALPS on our list. The bag comes with spacious pockets that allow you to store a lot of stuff securely. The bag also has a bow pocket fit for you to carry your bow. It can fit any bow easily. The bag is designed to especially for the wilderness. The product comes with comfortable shoulder straps. The bag is made of waterproof material. 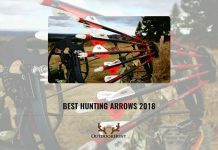 For a great hunting trip, you can trust this bag completely. Store all your hunting tool and transform your hunting experience with this product from the ALPS. 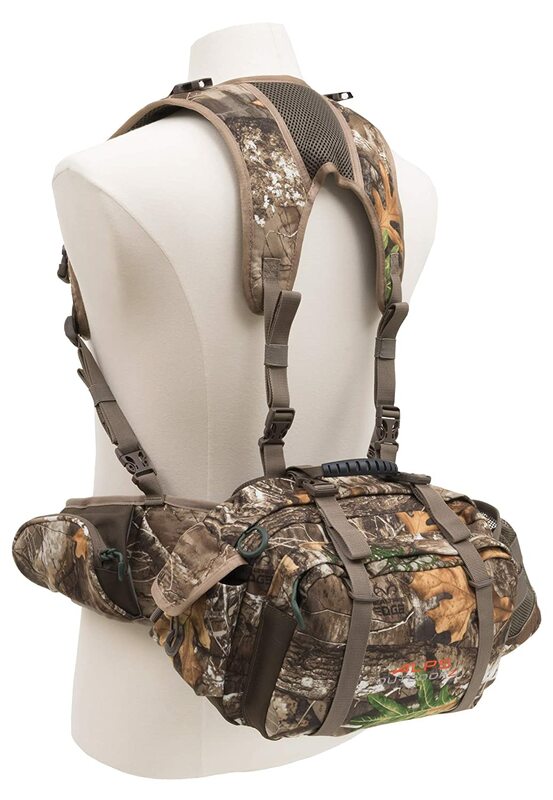 This bag is not only ideal to take it out on hunting trips but, you can also carry this bag on short trips or camping. The bag has a lot of space for you to store your items with great care. And, the mossy oak pattern on the bag helps you to stay hidden in the wilderness. The bag is compact but can still hold a lot of items without an issue. Although there is no shoulder strap in this bag, it is still comfortable to carry it. The bag has a very attractive design. It comes with a sufficient number of pockets. It is made with fine quality breathable mesh and has dual zipper compartments. The product is built for outdoor purposes. One should always have all the essential items when they are planning to go out and hunt for the day. Apart from bringing the warm clothes and water you will be needing several more items in your backpack. Flagging tape: One can find the flagging tape in the backpack of a smart hunter because the flagging tape will enable a person to mark down the location that has been already covered or during an emergency situation. One can use the vibrant colours like orange and pink as they will be more visible and attention-grabbing. Ensure that you are bringing back the flagging tape that has been used while you are departing from that place as it may cause confusion for the other hunters. A compass: Having an inexpensive compass in your backpack is very important. To be more secure you can bring two compasses because it will make it more convenient for you if you are confused with the direction shown by one compass. Cross checking will help you to check the accuracy. The right food: While you are out for hunting it is very important to bring all the essential food. Bring dry fruits like Raisins, Granola Bar, Bagels, cheese, and some fruits like apple that will help you to last for a day. First aid items: Going for hunting without a first aid box is a wrong move because it is one of the basic need. You will need to include a tourniquet, tape, bandages, gauges, and some antiseptics as it can help you to give some medication to open wounds. The weight of your backpack will be directly proportional to the time that you will be investing outside. Bringing emergency shelter can be a good move if you are planning on staying outside during the night time. Bringing more items can add more weight and bulk to your backpack so you will need to pick it accordingly. Bringing the brightly colored and large trash bags can be helpful as it can serve you when you will be needing to block the winds or trap the body heat. Spotting from above can also help you if you are in any kind of emergency situation. 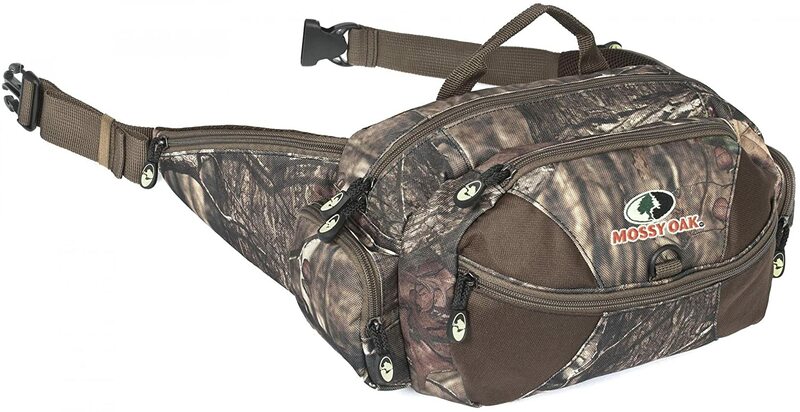 This attractive looking fanny pack is just the bag you need on your hunting trip. Carry all your essentials with security in this bag. Thus, it can be concluded that a fanny pack is one of the best companions that you can have out there in the wilderness. Choose the right bag, and you are all set to go. Now, that you know the top 5 picks of fanny bags, buy the one according to your choice. All the products are top-level products so; it doesn’t matter which one you choose.